You can’t transfer many types of files, including some types of music files. Syncing can overwrite the data you already had on your device. You can’t transfer and share files among devices that have different Apple IDs. You can’t transfer your music anywhere you want, like an external drive. You can’t extract music that’s not purchased from iTunes from iPhone. Of course, the solution is to extract music from your iPhone without using iTunes. How can you do that, though? Well, there is a great third-party tool that you can use to manage and transfer your iPhone files called iMyFone TunesMate. It’s better than iTunes because it can extract music from your iPhone and save it anywhere you want. Copy purchased or non-purchased music from iPhone without any limits. Get music off iPhone to computer, iTunes library or external hard. Can extract almost any kind of media file, like songs, movies, photos, playlists, audiobooks, ringtones, podcasts, etc. Share your files with other devices, even ones with different Apple IDs. Rebuild your previously damaged iTunes library or enrich your library from unlimited iOS devices. Step 1: Download and install TunesMate. After that, plug your iPhone into your computer’s USB port, and then launch the TunesMate program. Step 2: On the main TunesMate screen, look for a tab at the top that says Music. Click this tab. 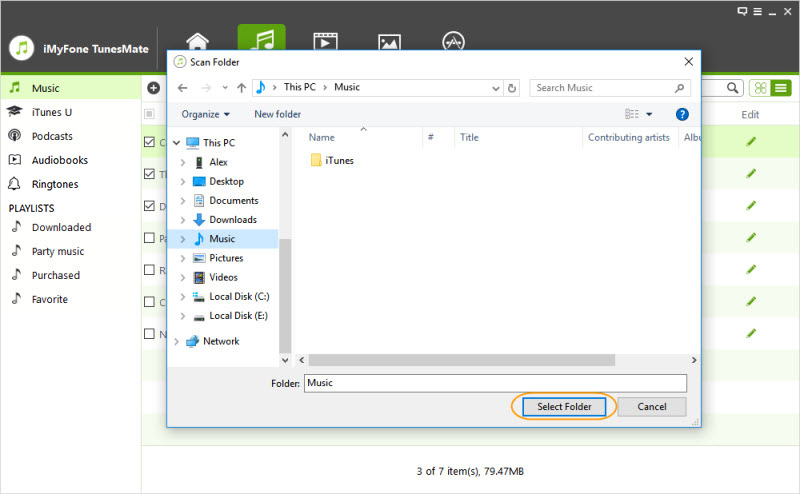 Step 4: Browse for where you want to send your music in your file system, and then click Select Folder. Now you can just wait while the software transfers your music to your PC. With TunesMate, transferring music from your phone is basically as easy as using an external drive. You have complete freedom to transfer your music, and many other kinds of files too, such as video, photos, and contacts. It’s one of the best overall file managers out there, and it really gives you a lot of control over your music. At the end, we also want to show you what the differences between TunesMate and iTunes. Some files won’t be transferred, like ringtones, etc. According to the comparison table, iMyFone TunesMate is your better choice to extract music or manage music on iPhone as it gives you more freedom and controls. Go ahead, download TunesMate for free trial. 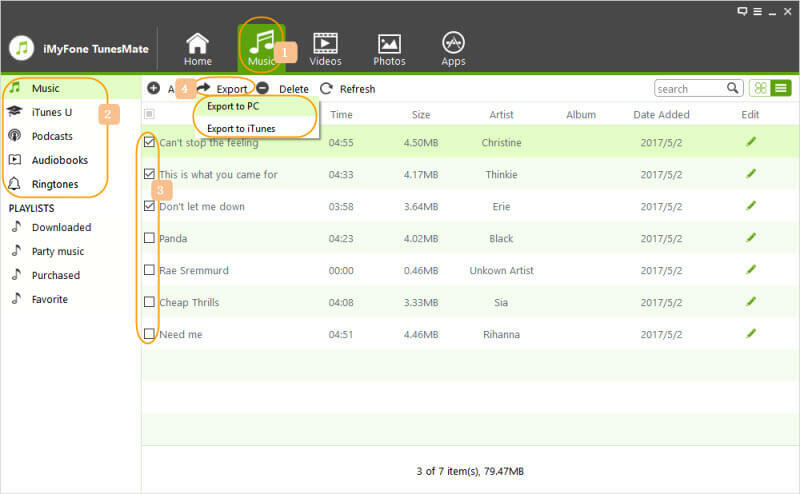 You can extract or manage 5 music files for free. If you need to manage more files, get a registration code to register it to enjoy its unlimited functions. Cannot Transfer Music from iPhone to iTunes? Don’t Worry, The Fixes!